I did this walk on Monday 20th July 2009. 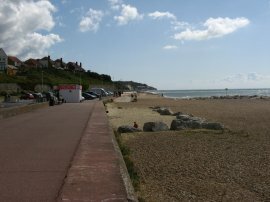 I drove down from Walthamstow and parked at the same spot on the seafront at Hythe, near the end of Twiss Road, where I had parked a few weeks earlier when Anne and I had walked the Elham Valley Way. From there I then set off along the beach front promenade path, photo 1, which runs parallel to Princes Parade in the direction of Folkestone to reach the start point of the Royal Military Canal path by Seabrook. Just before I left the seafront there were a couple of notices warning members of the public not to harass "Dave the Dolphin" although I was unable to spot him out at sea. 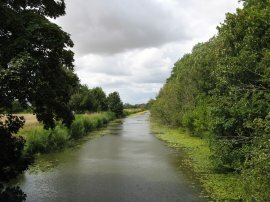 Reaching Seabrook, close to the junction with the A259 Sandgate Esplanade, I turned to my left and having crossed over the sluice at the head of the canal, photo 2, joined the canal side path and began heading back towards Hythe. 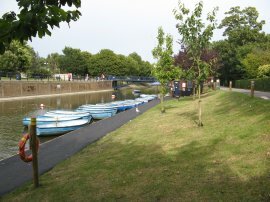 The route initially joined a grassy path running alongside the canal with houses hidden behind trees on the right and across the canal on the grounds of the Hythe Imperial Golf course. Reaching Twiss road, near to the centre of Hythe the route joins a tarmac path running alongside more landscaped grounds, photo 3. 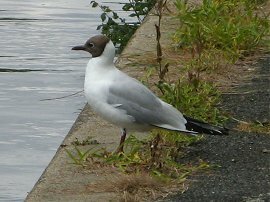 The canal through Hythe was a popular place for birds particularly a number of Black-Headed Gulls, photo 4. 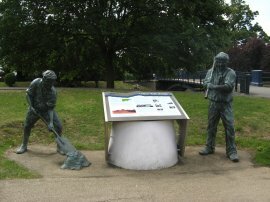 There were also a number of information boards describing the history of the canal along with a number of life size sculptures, photo 5. 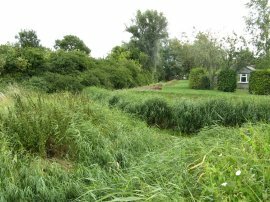 Much of the town of Hythe remains hidden from the canal bank although the route does rise up to cross over the A259 before running alongside the A261 Military Road. 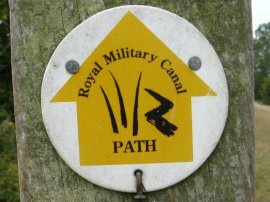 Reaching the end of the Military Road the route heads across the A2008 and continues ahead along Green Lane for a short distance before once again joining the a grassy tree lined track running alongside the edge of the canal. 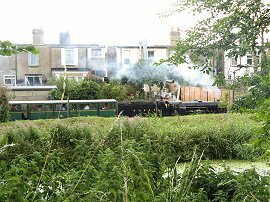 On the other bank of the canal, hidden amongst the trees was the terminus of the Romney Hythe and Dymchurch railway and I was able to catch ta quick glimpse of a train setting out from the station through a gap in the vegetation, photo 6. 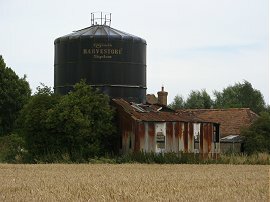 The built up area of Hythe is soon left behind as the route heads out of town and into the surrounding countryside, photo 7. The trees lining the path often concealed the canal from view, as well as limiting the views from the path to the low cliffs that the canal runs below. A little distance out of the town by the Palmarsh Footbridge I came across a small, but working, model of an acoustic mirror besides the footpath. 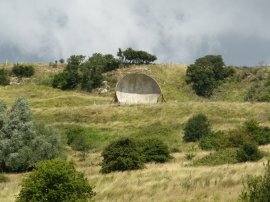 The concrete acoustic mirrors were constructed as an early warning system, intending to amplify the sound of approaching enemy aircraft and a little further down the path I was able to spot a full size version on the hills above the path, photo 8. Meanwhile the footpath, photo 9, continued along towards the road bridge at West Hythe. Once over the road the path heads down to West Hythe Dam from where photo 10 was taken, looking back up the canal towards West Hythe. 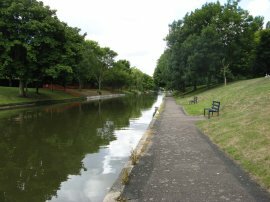 The tree lined nature of this section of path meant that the views from the bridges were often the best way to catch sight of the canal. 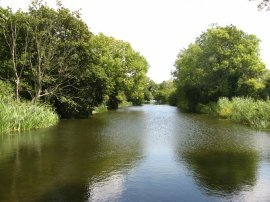 A little further on the route of the Saxon Shore Way joins up with the route of the Royal Military Canal path along a stretch of canal that runs alongside the grounds of Port Lympne wild Animal Park. I was unable to spot any animals whilst walking past although a number of safari buses on a tour of the park went by on the other side of the fence that separates the park from the canal. I hadn't enjoyed this section of path when I had walked it as part of the Saxon Shore Way and it probably was one of the worst bits of the entire walk, being set back from the canal and rather gloomy to walk along although Aldermans Bridge provided another oportunity to take a photo looking down the canal, photo 11. 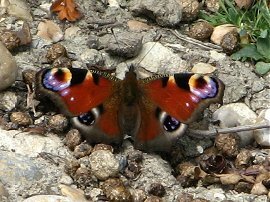 Near the bridge I spotted a peacock butterfly resting on the ground, photo 12. 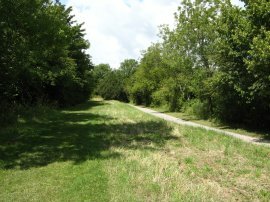 Reaching a stretch of concreted lane besides Honeypot Cottage, the Saxon Shore Way leaves the Royal Military Canal while the canal path continues ahead along a low grass bank running alongside the lane, photo 13. This marked the start of a much more open section of the path with wide views over the fields on either side of the canal as the route heads on to Gigger's Green Road. Once over the road it was not much more than half a mile further along the canal to reach the next road, just below St Rumwold's Church, photo 15, where I finished this stage of my walk along the Royal Military Canal Path, having walked 9.0 miles along the path from Seabrook. However this was not then end of my walk for the day as not only did I have to get back to the car but one of my aims while walking the Royal Military Canal Path was also to do a bit of exploration around Romney Marsh, an area I have not walked previously. I turned to my left along the road to cross over the canal, intending to take a footpath on the right that headed out over the fields in the direction of Honeywood Farm. However there was no signpost marking where the footpath left the road and no sign of any path through the crop of wheat in the field as I started to discover what a walker unfriendly area this was. With the lack of any signposting or any path through the waist high crop I decided it was best to head down the road, photo 16. 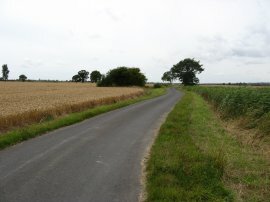 I followed the road as it gently wound between fields towards a junction on the right. 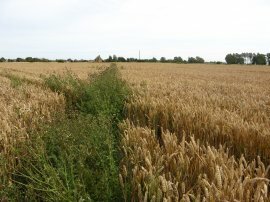 Just before I reached the road junction I was able to cut across the top of the last field on my right to join a small stretch of footpath that had been cut across the crop however in the other direction, from which I had hoped to have come, the route crossed a wooden bridge over a drainage ditch into a wall of crops. I soon crossed this small stretch of field I could walk over and turned to my right along the road towards Honeywood Farm. Here I soon passed the point where my intended footpath should have reached the road. It was marked by a newish footpath marker besides the road however this was pointing into an impenetrable hedge, photo 17, which also incorporated a wire fence as well and was completely impossible to negotiate. Behind the hedge there was then an electric fence and an enclosure of free range chickens however if the line of the footpath has been re-routed why is no alternative route marked and why is there such a new footpath sign pointing along the supposed direction of the path from the road? Reaching Honeywood Farm I joined a footpath that left the road on the left and headed over fields towards Newchurch. 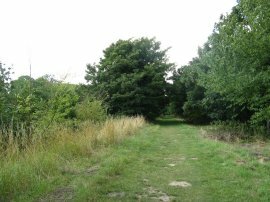 There was a clear path through the first field which led down to a rather overgrown path running alongside the edge of a drainage ditch. 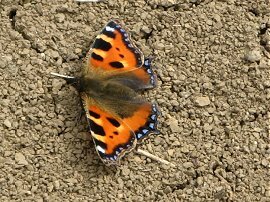 On the path I was able to spot a Small Tortoiseshell Butterfly sunning itself, photo 12. 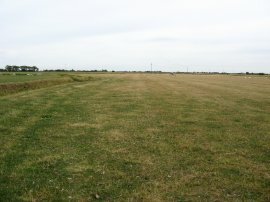 At the end of the fields the route of the footpath is shown as crossing over a drainage ditch, photo 19, however there was no bridge to cross the ditch. There was however a second footpath a little to my left that runs by the farm buildings in photo 20 and down through a garden and driveway to reach the road. On Google maps the route of the second footpath is clearly visible through the wheat field however the path hadn't been re-instated when I went past in 2009. Once on the road I headed to my right for a short distance before turning to the left down Mill Lane. 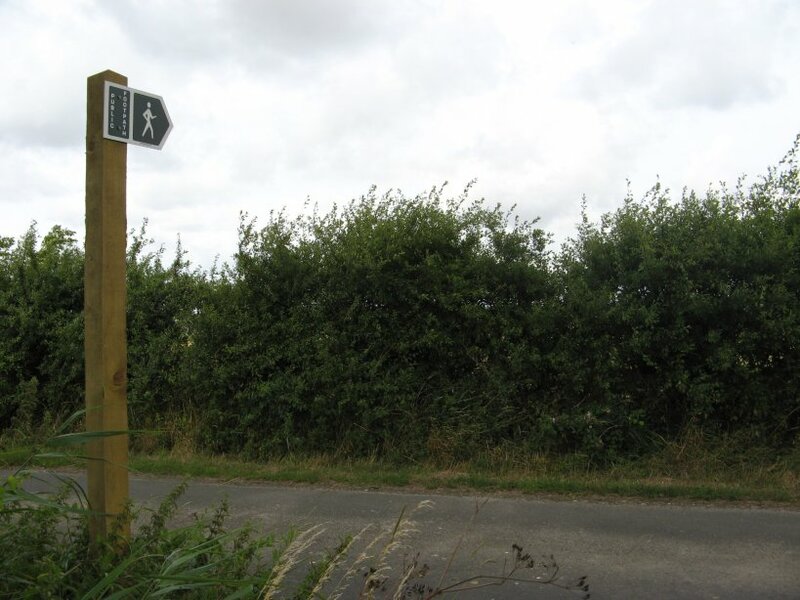 While on the road I passed the pole for the footpath sign marking the route I had intended to take and while the footpath sign itself had been broken off there was a yellow sticker on the pole stating "KCC Public Footpath number HM185". 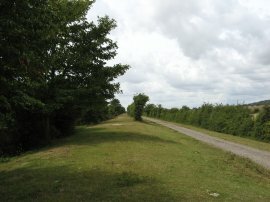 Mill Lane soon leads out into an area of pasture along a footpath that follows the Bilsington Sewer, photo 21. 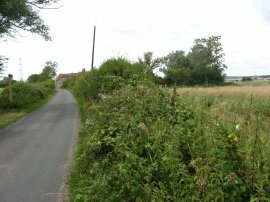 At a wooden bridge I crossed over the drainage ditch and headed along a path than ran over a variety of fields to reach Gammon's Farm Lane. 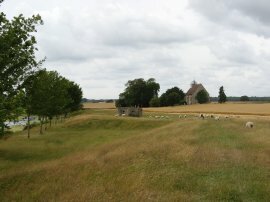 Although some of the field edge paths were a little overgrown, where the route of the footpath crossed through a crop the route of the path had been cleared which made a pleasant change from the start of the walk from St Rumwold's Church. On the whole though the paths seemed little used and some of the wooden bridges over the drainage ditches were quite rickety, photo 22. The path I had been following took me towards the Eastbridge Road on the outskirts of Dymchurch where the final section of path down to the road, although marked across the field, had filled up with thistles, photo 23, which made walking along it rather difficult. 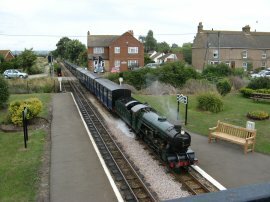 Reaching the road I turned to my right and a short distance further came to the level crossing for the Romney Hythe and Dymchurch railway where looking to my right I could see the Dymchuch station a short distance away, photo 24. 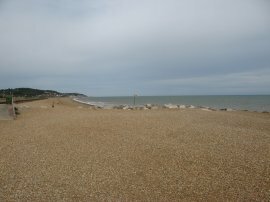 When I had started the walk it had been my intention to walk down to the coast and then head back along the seafront, skirting the Hythe ranges if necessary; I had heard plenty of firing during the earlier stages of my walk. 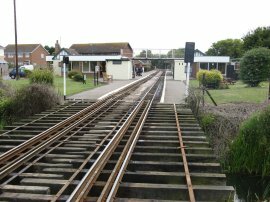 However the poor quality footpaths had delayed me considerably and thus I decided to save some time and take the miniature railway back to Hythe. It was not possible to walk the short stretch besides the tracks from the level crossing to the station, photo 25, and thus I had to walk three sides of a rectangle, continuing down the road to Mill Road and then up Station road. Having brought my ticket I had a fifteen minute wait for the next train which left at 4:30 for the sedately paced 20 minute journey back to Hythe. It was an enjoyable trip and I was glad I had made the decision to have a ride on the railway rather than continue walking. 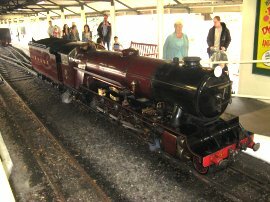 Having stopped to take a photo of the engine that had taken me to Hythe, photo 26, I set off back through Hythe towards the car. 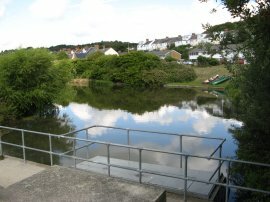 From the station I headed down the opposite bank of the canal to the canal path, photo 27, before cutting through a recreation ground to reach Twiss Road from where it was just a very short walk down to the seafront where the car was parked. Arriving at the car I had walked a total distance of 17.6 miles. 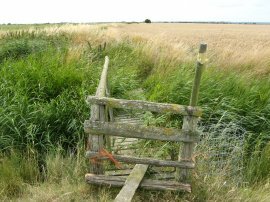 I had enjoyed most of the days walking although the state of many of the footpaths on Romney Marsh had been rather irritating and slowed me down.